for new and existing members of the Oh Canada Etsy Team. To join our fantastic team, please see our Membership Guidelines or visit our Etsy Teams profile. Our official tag is OhCanadaTeam - without spaces. When you add this tag to your Etsy listings, it will help shoppers find you. It will also help team members find you for treasuries and blog features. All types of shops - handmade, vintage, and supplies - are welcome, so long as they are run by Canadian residents. If you need help or have questions, contact the admins through the team profile page. Our helpful team members can always be found in our current Oh Canada Chat Thread. Current team leaders are: Leanne of Leanne Designs, Molly of Little Bear's Mom and Joannie of Joanniel Creations. Oh Canada Team Blog - Promotions, Etsy Help and More! Oh Canada Team Facebook - Listings, Treasuries and Team News. Oh Canada Team Flickr Group - Team Creations. Facebook Networked Blogs - Follow Along! Oh Canada Team Twitter - Daily Team Updates! Treasury Archive - Some of Our Best Team Collections. The Oh Canada Team blog is a place to learn more about our members, their shops, and the places that we come from. Shop Links: Team member shops are added to the link list on the Oh Canada Team blog by request. If you do not see your shop listed in the sidebar of the main page, contact TeamOhCanada to have you shop added. Blogroll: Do you write a blog that focuses your craft, your shop, or Etsy in general? 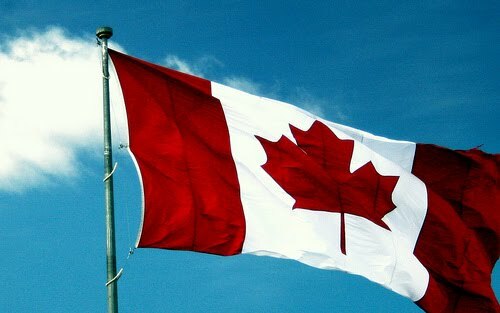 To be added to the Oh Canada blog list, grab our blog button, or add us to your blogroll. Then head back to the Oh Canada Team blog and comment on any post with a link to your blog. 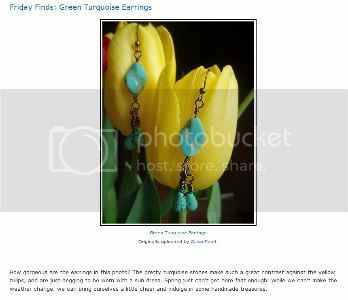 Friday Finds: To participate in the Friday Finds feature, you need to add photos to our Flickr group. For more details, see this post: Oh Canada Team on Flickr When you join, see the group discussions on Flickr for tips on being featured. Shop Spotlights: The shop spotlight interview feature is now open to all team members. The interview questions can be found in the "Files" section of the team Yahoo Forum. Both handmade and vintage shops are welcome to participate! Your interview will include links to your shop(s), blogs and social networking sites, plus SEO tagged images from your shop. 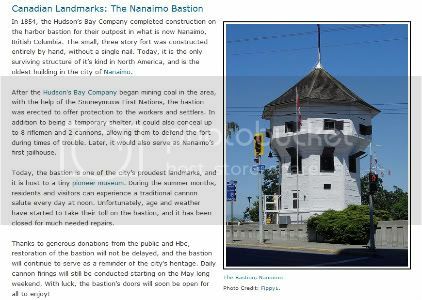 Canadian Landmarks: All team members are invited to write a guest post about an important landmark in their community. Write a few paragraphs about your chosen landmark, and send the information to Leanne or Molly (include a picture of the landmark if you have one, and the links to your research material). Your post will be added to the blog, along with an item photo from your shop, and a link. Craft Tutorials and DIY: Share a simple technique related to the products in your shop. You don't have to give away your best secrets - a basic technique that you would share with other artists in your medium is great. Product Use and Care: Do your shop items require special techniques, or can they be used in unique ways? Think "How to wear a sari" or "Hand washing your crochet accessories". Etsy Help: If you're an expert on writing door-crasher item descriptions, or know how to make business cards from scratch, share your talents with other sellers! Give us your best Etsy tip with examples of how it has helped your business grow! Behind the Lens: This spotlight on Etsy photography is your chance to share your best tips for taking great shop photos. All team members are welcome to participate. You can find the questionnaire in the Files section of the Oh Canada Team Yahoo Forum. Each feature will include SEO tagged images from your shop, as well as a picture of your photo 'studio'. Tag Workshop: This helpful exercise in Etsy tagging appears every Tuesday. Volunteers and quests suggest descriptive tags for each others' listings. Sign ups for the Tag Workshop are done on the blog at the end of each month. We love to share member treasuries! If you make a treasury that features Oh Canada Team members, or you know of one that does, share the link on the current team chat thread. Our admins scoop up these treasuries for our Facebook page, Twitter and Team Flickr Account. If you make an Etsy treasury with 6 or more Oh Canada Team members, you can use our official team tag "OhCanadaTeam" which will add it to our pool of team treasuries. Product Photos: Pictures will be added to the themed Facebook albums by request. Team members can submit one item photo per category/album. To add a photo or change an existing one, contact Molly or TeamOhCanada. Fan photos are always appreciated! If you have purchased an item from a member of the Oh Canada Team, you are welcome to upload an appreciation photo to the Facebook Fan Page. This will help show off our team's great creations, and encourage other shoppers to interact with our page. Please do not upload photos of your own products to the Fan Photos section. Fan Page Favorites: Members that have Facebook pages dedicated to their Etsy shop can submit their link to be featured on our team's favorites. Contact Molly with your link. You can also add our Facebook page to your page's favorites to help gain more exposure for the team. Wall Posts: If you have a shop announcement that would appeal to team members and fans, share it on the Oh Canada Team Wall. Sales, contests, blog features and other news about your shop is welcome. When posting, please respect our team members and readers - if it feels spammy, it probably is. Fan Wall Posts will be visible to direct visitors. If you have an announcement that you would like to share with all of our Facebook fans, share it with us in the current Etsy chat thread or in the Yahoo forum, and our admins will do their best to include it with the day's Admin Wall Posts. or send a message to the admins through the team profile page.